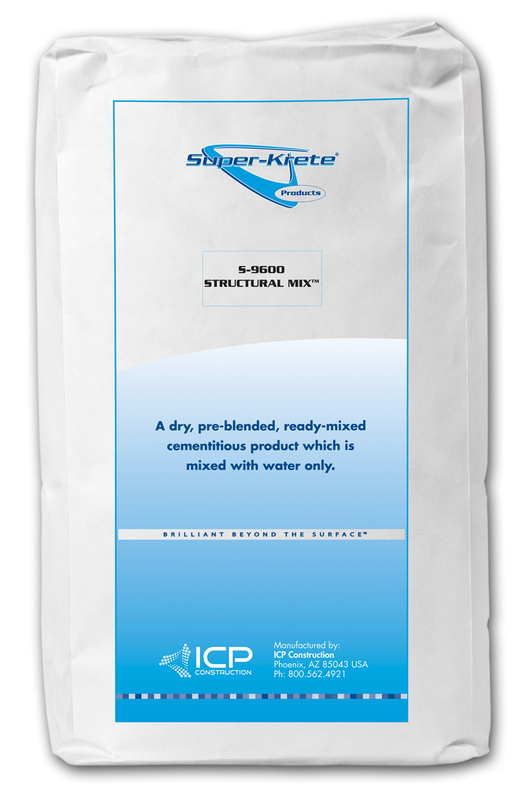 Super-Krete S-9600 Structural Mix is a dry, pre-blended, ready-mixed cementitious product which is mixed with water, and used for the repair of structurally damaged concrete substrates. Structural Mix provides a co-adhesive bond with the substrate and provides a compressive strength of 8,500 psi while retaining flexibility to allow for structure movement and to resist cracking at the contact point. Structural Mix can be installed from zero inches to any thickness in a flowable or dry pack consistency. Structural Mix is used for repairing structural failures, for re-leveling and re-grading, and for both thin- or deep-fill overlayments. Structural Mix is used for structural repairs of bridges, parking structures and many other cementitious substrates. Structural Mix can be applied by squeegee, trowel or screed.